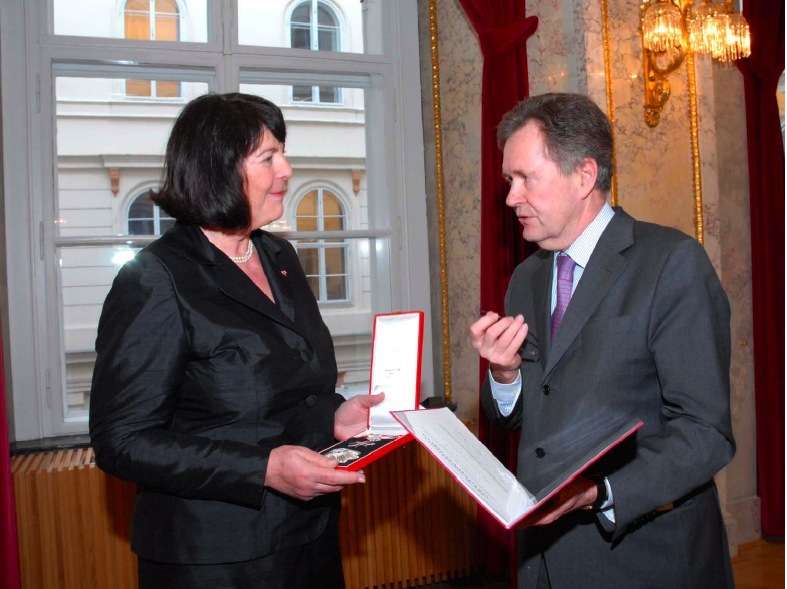 Dr. Eva Nowotny was awarded the Grand Decoration of Honor in Silver with Star for Services to the Republic of Austria as a token of appreciation for her significant achievements during her distinguished diplomatic career as Ambassador to the United States, the United Kingdom and France. The award was presented by Secretary General Hans Kyrle on March 3rd, 2009, as part of a ceremony held at the Austrian Ministry for European and International Affairs in honor of her retirement from the Foreign Ministry. Born in 1944 in Vienna, Dr. Nowotny completed her primary and secondary education in Vienna, followed by six years at the University of Vienna, where she graduated in 1968 with a Ph.D. in History and German. Her doctoral thesis was written on “Metternich and England.” She began her professional career as an Assistant Professor and taught at the University of Vienna until 1973. In 1973 she joined the Federal Ministry for Foreign Affairs with assignments to the Press and Information Dept. and the Division of Legal Affairs. Her first posting was with the Austrian Embassy in Cairo (1976-1978) where she served as First Secretary to the Cultural Institute. As Counselor and Vice-President of the Special Political Committee of the 36th General Assembly, she served from 1978-1983 with the Austrian Permanent Mission to the United Nations in New York. Returning to Vienna in 1983, she was Foreign Policy Adviser to the Federal Chancellor of Austria, first to Dr. Fred Sinowatz and then to Dr. Franz Vranitzky from 1986 until 1992. From 1992-1997, she served as Austrian Ambassador to France, and from 1997-1999 as Austrian Ambassador to the Court of St. James in the United Kingdom. After serving in the Ministry for Foreign Affairs in Vienna from 1992-2003 as Director General of European Integration and Economic Affairs, she was appointed Ambassador of Austria to the United States,a position she held until retirement on September 30, 2008. In February 2009 Dr. Nowotny was appointed President of the Austrian UNESCO Commission for a three year term.